Posted for Bjarney, he should be adding some details regarding this soon. Should there be a HV fuse missing?. Bjarney: Is this a normal way of setting up secondaries in this area? Bundling conductors from the transformers, passing conductors through small raceways from one side of the crossarm to another...it just looks unusual. Looks to me like the primary is WYE with connections being made between two phases and the grounded (unfused) leg, and the secondary is open delta. I guess this would really be a 2-phase system, and not true 3-phase. That style of running wire across in conduit from one end of the crossarm to the other is common in this area, especially on older installations. This is a three-phase, four-wire open delta. A delta, unlike a wye, can be achieved with only two transformers. There probably are some two-phase circuits left in the world, but they grow increasingly scarce by the year. I've never seen two-phase, and I very much doubt I ever will. Using a crossarm for the secondary is kind of archaic, isn't it? I've seen it in old pix from the '40s and earlier, but it's pretty rare nowadays, I think. Well, not true 2 phase, but if you look at the primary, it looks like only 2 of the 3 phases are actually connected, with the third connection being common to both transformers, and connected to the grounded leg. I'm assuming it is a grounded leg, since it is separated from the other 3, marked differently (note the yellow mark on the crossarm), and unfused. Now if the primaries were tapped from all three of the ungrounded legs, ignoring the grounded leg, I would say it was 3 phase, but right now, it looks more like pseudo 3 phase derived from a single phase primary. Note that there are four wires on the primary crossbar, and the one on the right is, as you observed, evidently the neutral. Note also that there are, as previously observed, only two transformers. A single-phase xfmr may be connected between any two primary conductors to obtain the desired voltage. Whether phase-to-phase or phase to neutral does not matter, provided the turns ratio is correct for the application. One xfmr is connected phase A to neutral, and the other, phase B to neutral; am I correct? Doesn't this provide a 120 degree displacement between xfmrs? So, as we have seen, the secondary is a four-wire open delta (center tap of one xfmr grounded), and the primary is also an open delta. Yes, I know it is tapped from a wye circuit, that much is clear. However, how is it possible to have a wye configuration with only two transformers? It isn't. Let's assume the primary circuit is 12,470Y/7,200. 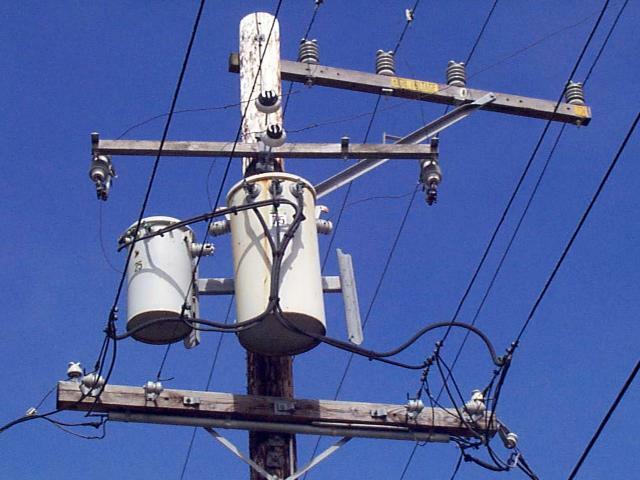 That means the xfmr primary windings are arranged as a 7.2 kV, corner-grounded, open delta. Good eye observing the primary. I usually just focus on the secondary, since that's where I will be working. What is an open wye? Which conductor is omitted, and with the omission, how does the system continue to be a wye? Now that I think of it, the primary shown here should not differ, except in voltage, from a 120/208 single-phase "network" service. In such a case, you have 120 degree displacement, but you also have 120V to neutral from either phase, and 208V between phases. This is distinctly different from a corner-grounded delta, in which one phase is grounded and the other two are equal in potential with reference to each other and to the grounded phase. I was always taught that a 3-wire 120/208 service is single-phase, but looking at this photo, and following the logic of the schematic, it seems there should be three phases there. I've never tried checking this with a scope.